Peter Tikuisis completed his Ph.D. in Mechanical Engineering at the University of Toronto in 1981. He was a defence scientist at Defence Research & Development Canada, Toronto Research Centre until 2015. He currently holds an emeritus defence scientist position at DRDC Toronto and is an adjunct research professor at the Norman Paterson School of International Affairs, Carleton University, Ottawa. He has published research in bubble physics, cold physiology, soldier performance, and most recently on state fragility. In response to calls for nuanced and context driven assessments of Poor State Performers (PSPs),1 this paper seeks to overcome a key deficiency of single rank indices. One-size-fits-all ranking systems lack clarity and create confusion. As Faust et al. (2013: 7) noted, what is needed is a bridge between single score rankings “and the anarchic picture emerging when every country context is considered as qualitatively different.” That such approaches are possible has recently been demonstrated in formal modelling (Besley and Persson 2011) and through data-driven clustering (Carment et al. 2009, Grävingholt et al. 2012, Tikuisis et al. 2013, Ferreira 2015). The latter objective recognizes the need for greater specificity in identifying state trajectories for the purpose of crisis early intervention policies (O’Brien 2010). Crisis decision support tools should provide generalizable crisis antecedents, i.e., identifying both the causal mechanisms driving the crisis and the likelihood that the crisis can be avoided given specific policy responses (Carment and Harvey 2000). This suggests a significant departure from single rank indices that simply rank states on a scale from strength to weakness. In other words, the vector of change (direction and speed) that we examine involves non-linear shifts from one state type to another. We meet these objectives by building on the concept of state typologies (Tikuisis et al. 2015) that identify states as highly functional, moderately functional, impoverished, brittle, struggling, or fragile, in two ways. We first address missing indicator data by using data from different sources that do not require imputation and, second, we apply cluster analysis for identifying statistically significant demarcations of certain state types to guide the grouping criteria for state categorization more objectively. Our results are both novel and surprising. Far from being a reiteration of single rank indices, the model developed in this paper typologically differentiates types of PSPs in a large comparative framework to understand the conditions under which specific types of states are likely to improve or deteriorate over time. In terms of the surprising elements of our findings, state weakness appears less as a transitory phenomenon and more as a chronic one featuring limited mobility (i.e., essentially stagnation or oscillation between states of weak categorization) for those countries characterized as impoverished, brittle, struggling, or fragile. We also find that of the transitions that do occur, most are dominated by changes in state legitimacy. Fragile states are known to be prone to intrastate conflict (e.g., Hegre and Sambanis 2006), which lends credibility to the model’s discrimination of other types of weak states, not all of which are prone to conflict. For example, there is a tendency for aid donors to favour states that are weak in capacity but functional in policies and institutions, and largely free of violent conflict. Hence, we additionally examine the relationship between aid allocation and state type, confirming a donor bias towards states weak in capacity, but bolstered by moderate levels of authority and legitimacy. Such discrimination is not evident with single rank indices. We close with recommendations on further developments to operationalize these categorizations for future state assessments and intervention policy guidance. Further justification for single ranking of PSPs was provided by the World Bank using its LICUS (Low Income Countries Under Stress) and CPIA (Country Policy and Institutional Assessment) frameworks. Both showed that very weak states could be the crucible for terrorist activities and vectors for the transmission of transnational conflict, crime, disease, and environmental instability.6 While single rankings of PSPs might still resonate from a policy perspective, they are not without their critics (Faust et al. 2013). Such rankings have little forecasting value, basically confirming what policy makers already know. It is also very difficult to derive meaningful policy implications from a single rank index. Recently, Third World Quarterly devoted an entire issue questioning the utility of country rankings and the concept of fragility because of their overly simplistic and unhelpful portrait of donor recipient country problems (see Grimm et al. 2014).7 This criticism is echoed by Pritchett et al. (2012) who show that PSPs emulate the institutions and development processes that donors require of them in a form of isomorphic mimicry. But it is the FFP-FSI that has been the focus of the most pointed and detailed criticism. For example, Gutiérrez-Sanín (2009) and Gutiérrez-Sanín et al. (2011) demonstrate that the lack of formal definitions and operational variance of the FSI generate significant gaps between it and other indices. Coggins (2014) also asserted that the FSI uses categories that remain undefined, that its indicators are not transparent, and that the ranking of certain states defies logic. In their critique of the FSI, Beehner and Young (2012: 3) argue that states cannot be easily placed along a spectrum from failed to not failed, “Indeed, there is a conspicuous lack of semantic agreement, both within the scholarly and policy communities, over how to define or differentiate a failed from a failing or a fragile state.” Moreover, “The consequence of such agglomeration of diverse criteria is to throw a monolithic cloak over disparate problems that require tailored solutions” as noted by Call (2008: 1495). The policy implications of using a single ranking of PSPs such as the FSI are significant. As observed by Bakrania and Lucas (2009), Chauvet et al. (2011), Faust et al. (2013), and Brinkerhoff (2014), conceptual ambiguity makes it more difficult to derive effective responses. This includes repairing deteriorated situations, dealing with regional spillover effects, and helping to create a long term policy environment in which poverty reduction, property rights, and good governance can become feasible.10 Apart from the need to better understand the type and amount of resources to allocate at any given time and place, donors also need to understand the likely consequences of such allocation in advance. In brief, ambiguity on differentiating certain weak states from others makes it difficult to focus on priority problems and to prescribe suitable interventions.11 Indeed, applying a tailored approach better suited to decision making beyond just a single ranking of performance is a key requirement of PSP analysis advocated by several investigators (Blair et al. 2014, Goldstone 2009, Furness 2014, Brinkerhoff 2014, Marshall and Cole 2014), all of whom have argued against single rank indices. This A-L-C approach is in fact a synthesis of different theoretical foundations and three policy-inspired research streams, namely conflict, security/stability, and development (Carment et al. 2009). The conflict stream – represented by authority – is a product of early warning and conflict prevention tools developed in the 1990s as the world shifted from interstate to intrastate conflicts in the final years of the Cold War, and continuing thereafter with certain negative outcomes of countries such as Rwanda, Sierra Leone, and Somalia. The security/stability stream – represented by legitimacy – focused on threats that weak and failed states pose to their neighbors and the international community, such as the support Al Qaeda received by the Taliban regime in Afghanistan pre 9/11. The development stream – represented by capacity – drew support from the World Bank, OECD, and bilateral organizations such as the UK Department of International Development, and was the result of the poor track record of structural adjustment and market-friendly reforms conducted in various developing countries. It led to terminology such as “difficult partners, “difficult environments”, and “low income countries under stress” (LICUS). The State Typology Model was recently introduced (Tikuisis et al. 2015) for a more unpacked categorization of states. Specifically, it was developed to provide forewarning on the trajectories of states characterized as highly functional, moderately functional, impoverished, brittle, struggling, or fragile. For example, while impoverished states are hampered by low capacity, they are reinforced with moderate authority and legitimacy. Brittle states exhibit moderate authority and moderate to high capacity, but weak legitimacy. Fragile states are the polar opposite of highly functional states and stand out as highly susceptible to violent internal conflict. What the state typologies concept provided in its original form was a more nuanced, context specific, and quantifiable methodology for categorizing PSPs along the A-L-C dimensions. Herein, we improve upon the categorization of states using a more complete dataset and statistical clustering. World Bank indicator data14 were used exclusively for this study given their level of comprehensiveness, completeness, and availability. The number of indicators sought was also limited in adherence with the rationale of a minimalist construct (Briguglio 2003, Ferreira 2015, Lambach et al. 2015, Tikuisis et al. 2015); that is, fewer indicators lessen the potential ambiguity associated with identifying causal relationships between the indicators and changes in state status. The World Bank Worldwide Governance Indicators (WGI), of which there are six, were used to gauge the authority and legitimacy dimensions of stateness,15 and World Bank GDP data were used to gauge state capacity. Borrowing from the original definitions (Carment et al. 2009, Tikuisis et al. 2015), state authority reflects the institutional ability to enact binding legislation over its population and to provide it with a stable and secure environment. Four WGI were selected to represent authority: Government Effectiveness, Political Stability and Absence of Violence/Terrorism, Rule of Law, and Regulatory Quality (definitions are provided in the online Appendix A). The estimate for each aggregate indicator provides the state’s score in units of a standard normal distribution, i.e. ranging from approximately –2.5 (weak) to 2.5 (strong). We apply an unweighted average of the four scores to represent the raw value of state authority. State legitimacy reflects leadership support of the population along with international recognition of that support. Two WGI were selected to represent legitimacy: Control of Corruption, and Voice and Accountability (see online Appendix A). The estimates for these aggregate indicators were scored and averaged similarly to the indicators of state authority. State capacity is often judged by a multitude of attributes from a state’s military and economic strength to its human development capability. Using a multivariate approach, Hendrix (2010) concluded that state capacity can be essentially captured by bureaucratic quality and tax compliance. Yet, these measures largely encompass elements of state authority. Instead, we seek an alternative measure of capacity that reflects the state’s resources that can be mobilized for productive and defensive purposes. As a lead indicator of the productivity of a state, GDP can serve as an economic proxy for state capacity since the state relies, in large part, on its productivity to resource its capacity. In essence, capacity in our model represents economic resourcefulness. To separate the states, we first sought to identify two specific types of states introduced in Tikuisis et al. (2015), namely impoverished and brittle. This departure from clustering all states simultaneously distinguishes our two-tiered approach from others that simply rank states from strong to weak. States with moderate levels of authority and legitimacy, but challenged by weak capacity, are labelled ‘Impoverished’ (I). Using C > 6.5 as the threshold capacity value, twenty-eight impoverished states were identified by their average weak capacity while exhibiting stronger levels of authority and legitimacy. States that are weak in legitimacy, but not in authority and capacity, are labelled ‘Brittle’ (B) given their susceptibility to political instability, similar to the distinction noted by Rotberg (2004). Sixteen brittle states were identified by weak legitimacy (using L > 6.5) while exhibiting stronger levels of authority and capacity. We then applied cluster analysis20 with a specification of four clusters to separate the remaining 134 states using their 12-year average values of A, L, and C. This resulted in unambiguous demarcations of a ‘Highly Functional’ (H) group (FI range of 1.87 to 2.93) and a ‘Fragile’ (F) group (FI range of 6.55 to 7.97).21 A slight overlap occurred between the other two clusters with FI ranges of 3.18 to 4.56 (deemed ‘Moderately Functional’ (M)) and 4.48 to 6.31 (deemed ‘Struggling Functional’ (S)). By imposing a FI value of 4.6 to separate these two types, all states identified in the M group remain within that group while only two states, Brazil and Kuwait, move into the M group.22 The complete selection criteria are summarized in Table 1. An example of indicator scaling and state categorization is provided in the online Appendix A. Given the distinct demarcations noted above, we expect to find the fragility index significantly different among the different state types except between the impoverished and brittle states.24 We also expect a significantly higher level of violence in fragile states than any other state type. The unit of measure of violent intrastate conflict used herein is based on the integrated product of conflict duration (yrs) and conflict intensity (nd). We applied the Uppsala Conflict Data Program (UCDP) conflict intensity values of 1 and 2 based on the number of annual intrastate conflict deaths in the respective ranges of 25–999 and 1000+ reported by UCDP25 (no intensity value is assigned for fewer than 25 deaths). The effectiveness of aid allocation is clouded by definition and various performance metrics of merit exacerbating an imbalance of ‘aid darlings’ and ‘aid orphans’. The evidence for the selectivity of aid allocation based on the strength of the recipient state’s policy and its institutions is weak (Clist 2011). Aid donors tend to favour states that are weak in capacity yet exhibit functional policies and institutions (essentially moderate authority and legitimacy) over those that are deemed dysfunctional. Attempts to correct the imbalance are fraught with political sensitivities (Rogerson and Steensen 2009). Roughly, it is estimated that almost half of the allocated aid using DAC bilateral data26 is determined by donor-specific factors, one-third by needs, a sixth by self-interest and only 2% by performance (Hoeffler and Outram 2008). Hence, it is expected that impoverished states (weak capacity, but with moderate authority and legitimacy) receive higher levels of ODA (Official Development Assistance)27 compared to fragile states that are weak in all dimensions of stateness. Over the 12-year study period (2002–2013), slight deteriorations in the average values of A (from 4.92 to 4.90) and L (5.45 to 5.46) were found to be significant while a larger significant improvement in C (5.72 to 5.35) resulted in a modest and significant improvement in FI (from 5.36 to 5.24).28 Overall, the numbers of states that improved in A, L, C, and FI during the 12-year study period are 88 (49%), 92 (52%), 170 (96%), and 110 (62%), respectively. Sixty-one states improved in all three dimensions of stateness while six states (Bahamas, Central African Republic, Greece, Italy, Portugal, and Puerto Rico) deteriorated in all three dimensions. Figure 1 displays the scatter of the average A-L-C scores from 2002 to 2013 among the 178 states segregated according to state type. The poorest performing dimension (i.e., highest score) was capacity for the highly functional, moderately functional, and impoverished states, while it was legitimacy for the brittle, struggling functional, and fragile states. The complete list of state categorizations with descriptive statistics on the average A, L, C, and FI scores, as well as annual state status, is provided in the online Appendix B.
Scatterplot of the average A (authority), L (legitimacy), and C (capacity) scores of all 178 states allocated in their respective categorizations (H = highly functional, M = moderately functional, I = impoverished, B = brittle, S = struggling functional, F = fragile). Twenty-two states from Australia to the United States fulfilled the criteria for highly functional status. Thirty-five states were allocated under moderately functional status. Twenty-eight impoverished states were identified that include, for example, Belize, Maldives, and Zambia. Three brittle states, China, Russia, and Saudi Arabia are distinguished by their relatively strong capacity compared to thirteen other brittle states that exhibit moderate capacity. The range of the 36 struggling functional states is diverse from relatively strong members that include Mexico, Oman, and Turkey to relatively weak members that include Algeria, Armenia, and Venezuela. Finally, the list of 41 fragile states shown in Table 2 ranges from less weak members such as Bangladesh, Nigeria, and Papua New Guinea to quite weak members such as Afghanistan, Central African Republic, and Zimbabwe. 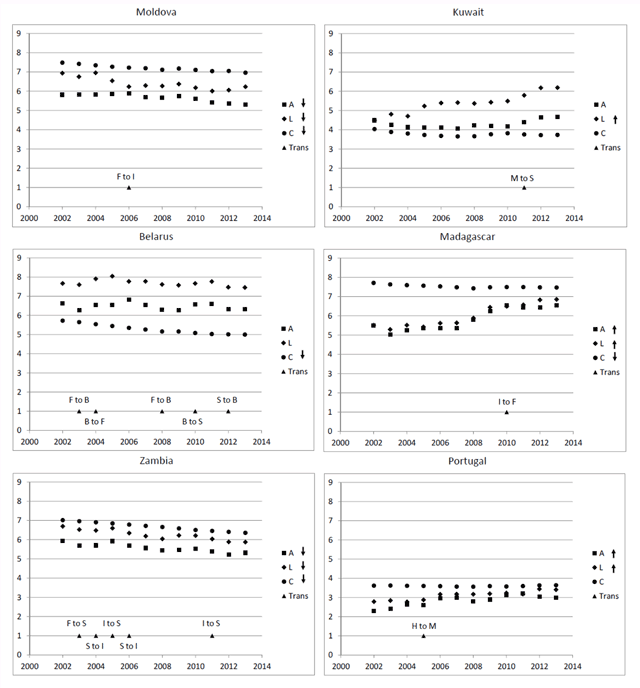 Categorization of Fragile States Overall state status based on the average A, L, C, and FI scores from 2002 through 2013 inclusive, annual state status (for blank fields, refer to previous year), years of intrastate conflict and integrated score (Sc) of conflict intensity × duration, and 12-year average net Official Development Assistance received per capita. (I = impoverished, B = brittle, S = struggling functional, F = fragile). As expected, all state types differ in their average fragility indices significantly from one another (highly functional (2.3), moderately functional (3.9), struggling functional (5.5), fragile (7.2)) except between impoverished (5.9) and brittle (6.1) states (Figure 2), which are henceforth not judged weaker or stronger from one another. Mean (±95% confidence interval) fragility index (FI), integrated duration × intensity of violent intrastate conflict (Conflict), and per capita ODA shown for each state type (H = highly functional, M = moderately functional, I = impoverished, B = brittle, S = struggling functional, F = fragile). The average integrated duration x intensity of violent intrastate conflict of fragile states (3.0) significantly exceeds all other state types except struggling functional states (similar average of 3.0; Figure 2). Thus, the expectation that fragile states are significantly more prone to intrastate violence than all other state types is mostly confirmed, specifically compared to H, M, I, and B states. It is noteworthy that a majority of fragile states (56.1%) experienced conflict at some time during 2002–2013 compared to about a third of the struggling functional states (30.6%) thus indicating a generally higher severity in the latter affected states. The average per capita ODA of impoverished states (155.0) significantly exceeds all other state types (Figure 2). Indeed, impoverished states with weak capacity and moderate levels of authority and legitimacy received more than twice the aid of the more violent-prone fragile states (average of 73.7). Overall, 122 transitions were observed among 17 different pathways among 56 states, representing almost a third of the 178 states studied. 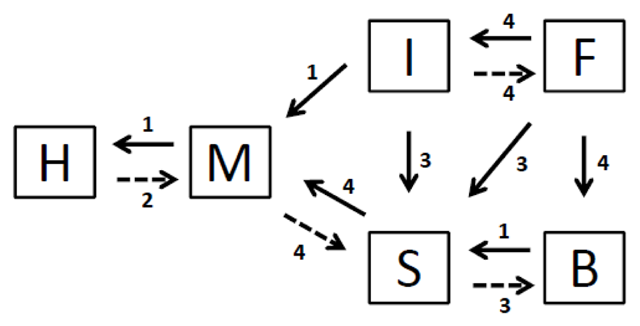 The majority of transitions (92%) occurred between B and S status (29%), I and F status (20%), S and I status (14%), M and S status (11%), B and F status (9%), and S and F status (9%). There were no transitions between M status with either B or F status. However, not all transitions led to an improvement or deterioration in state status between 2002 and 2013. We consider improvements or deteriorations to include any transition that shifts a state’s status from one type to another with a respective significant decrease or increase in FI.30 Of the 56 states that exhibited transitions, 21 improved and 13 deteriorated within the period of study representing almost 19% of the 178 states analyzed.31 Figure 3 provides an overview of these transitions, which gives a sense of their directional likelihood (e.g., transitions between I and M, I and S, and F and B status were exclusively uni-directional towards improvement). Also note that M status serves as the entry/exit point for H status. An important policy question concerning these transitions is to identify the state dimension most responsible for an improvement or deterioration. Block diagram depicting improvements and deteriorations in state status between 2002 and 2013 (H = highly functional; M = moderately functional; I = impoverished; B = brittle; S = struggling functional; F = fragile). Improvements and deteriorations are noted by the solid and dashed arrows, respectively, and the numbers attached to these arrows indicate the total number of states in transition. All transitions of the 34 states that improved or deteriorated were examined to determine the dimension(s) that led the transition. Figure 4 provides a number of examples. For instance, a decrease in L led to the transition of Moldova out of fragility to impoverished status in 2006; a decrease in C led to the transition of Belarus out of fragility to brittle status between 2003 and 2012; and decreases in A, L, and C led to the transition of Zambia out of fragility to struggling status between 2003 and 2011. Regarding deteriorations, an increase in L led to the transition of Kuwait out of moderately functional to struggling status in 2011; an increase in A led to the transition of Portugal out of highly functional to moderately functional status in 2005; and increases in A and L led to the transition of Madagascar out of impoverished to fragility status in 2010. Belarus and Zambia also display oscillations in state status owing to minor fluctuations in state dimensions, primarily A and L.
Plots of authority (A), legitimacy (L), and capacity (C) for various states against year showing examples of transitions in state status (H = highly functional; M = moderately functional; I = impoverished; B = brittle; S = struggling functional; F = fragile) denoted by ▲. The arrows adjacent to A, L, and C indicate a significant change over the 12 year period from 2002 to 2013. States that improved are shown on the left-hand side of the figure and those that deteriorated are shown on the right-hand side. In total, the number of occasions that changes in A, L, and C were responsible for the 21 transitions of state improvement were 11, 15, and 14, respectively. However, changes in A were always coupled with another dimension while changes in L and C were solely involved for 5 and 4 transitions, respectively. In contrast, C was not responsible for any transition of state deterioration. Of the 13 deteriorations, one involved a change in A alone, five involved a change in L alone, and the remaining seven involved changes in both A and L. In summary, changes in A, L, and C were responsible for 56, 79, and 41% of all transitions leading either to an improvement or deterioration in state status, thus underlining the dominant role of L. All transitions can be inspected in the online Appendix B. Comparison of state status between FSI and FI of the current state categorization model. Rank indicates worst to best in ascending order. FSI ranges from 0 to 120 (best to worst) and FI ranges from 1 to 9 (best to worst) (M = moderately functional, I = impoverished, B = brittle, S = struggling functional, F = fragile). With a focus on the weaker states, we also compare the identification of the World Bank CPIA states with the current model assessment. CPIA assessment is based on clusters of indicators pertaining to economic management, structural policies, policies for social inclusion, and public sector management and institutions.35 Low CPIA scores are used to generate the Harmonized List of Fragile Situations. Of the 178 states that we analyzed, 22 were common to the 2013 CPIA list. And of these, our model categorized twenty as fragile, and one each as struggling functional (Bosnia and Herzegovina) and impoverished (Solomon Islands), thus demonstrating high consistency between the two methods of weak state categorization. 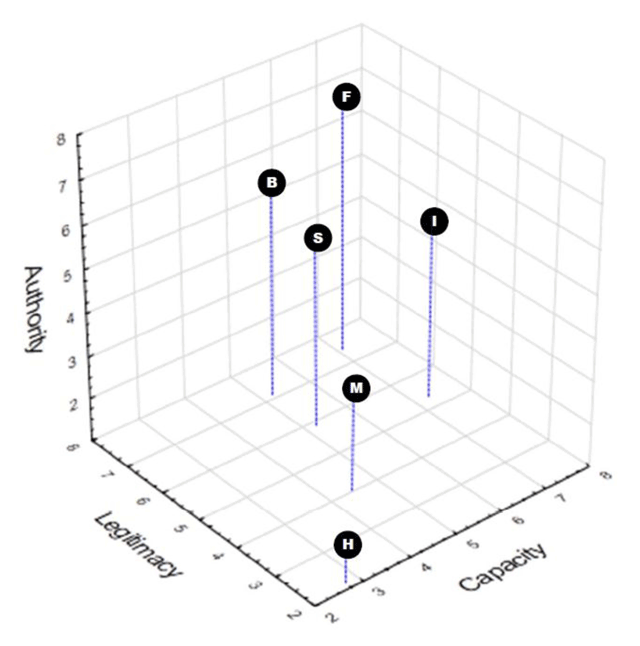 The state categorization model developed herein offers a more refined quantifiable methodology than previously introduced for categorizing six types of states along three dimensions of stateness: authority, legitimacy, and capacity. While we acknowledge that good qualitative and historical analysis is a strong contender to modelling (Gutiérrez-Sanín 2009), the analytical-descriptive value of our approach offers the potential to complement such analyses and to enable enhanced descriptions of the various manifestations of state strength that ultimately might contribute to better adapted interventions. The parsimonious approach in the number of indicators used also facilitates identifying causal relationships with changes in state status. Perhaps greater nuance could be achieved by considering sub-clusters of states such as semi-brittle or semi-impoverished, but at the high cost of markedly increasing the complexity of the separation criteria (Table 1). The general findings and geographical distribution of states according to type concurs with expectation.36 For example, the majority of fragile states are found in Africa (see Table 2). The finding of an overall improvement from 2002 to 2013 owing to a decrease in the average fragility index of all 178 states studied herein is also consistent with a broad consensus of global improvement, at least through the end of 2012 (e.g., Evans 2012, Arbour 2012, Marshall and Cole 2014, Tikuisis and Mandel 2015). The categorization schema can be applied for any state including those not analyzed herein as data become available whether for the years already analyzed or beyond 2013 (a demonstration is provided in the online Appendix A). Such categorization allows us to not only discriminate the types of weaknesses and strengths involved, but to also analyze state trajectories from positions of weakness to strength, and vice-versa. This construct circumvents a major criticism of single rank indices such as the FSI that simply place all states along a spectrum of fragility. While our model also furnishes a single rank index (i.e., FI), the distinguishing feature of our two-tier approach lies in its initial identification of impoverished and brittle states. Although subsequent categorization is based on FI, this is a simplified and convenient consequence of the statistical clustering of the A, L, and C values. The end result is quite sound given that the differences between H and M states, and between S and F states is in the degree vs. kind of their strengths and weaknesses, respectively. An instructive example of the diversity that this state categorization offers for a more informed target intervention is demonstrated by the assessments of Maldives, Egypt, and Guatemala with similar respective average fragility indices of 6.04, 6.02, and 6.04 (see online Appendix B). These states, however, were respectively categorized overall as impoverished, brittle, and struggling functional status owing to their very different average A, L, and C scores. Without such discrimination as noted earlier by Faust (2013), these states might be viewed similarly using linear indexing and in equal need of non-differentiated assistance. 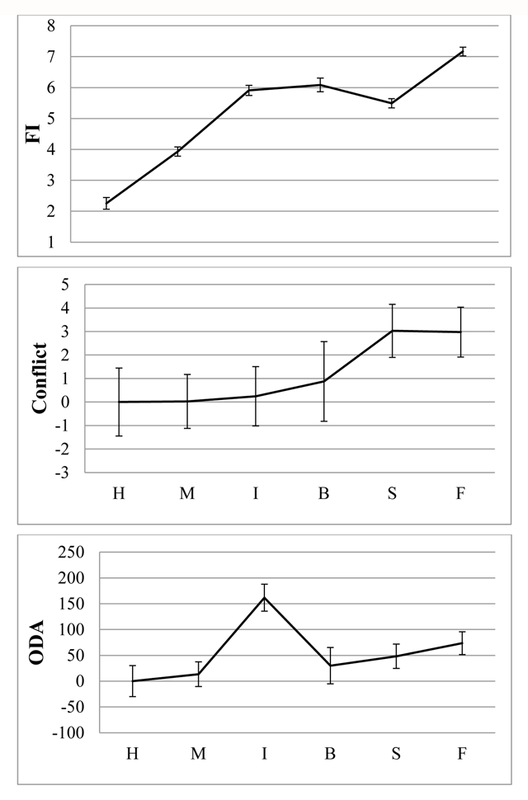 Closer inspection of the level of internal conflict in the struggling functional states indicates that certain of these states with moderately strong capacity (C < 5) average almost six times the integrated conflict intensity (6.1) compared to the other S states (1.1) with weaker capacity (see online Appendix B). This striking difference highlights the seemingly ineffectiveness of the stronger capacity of states such as Turkey, India, Thailand, Colombia, and Algeria to stem their internal violent conflict. In other words, it appears that capacity (economic resourcefulness) has limited leverage with regard to state security, at least in these and certain fragile states such as Libya, Iraq, Nigeria, and Pakistan with average capacity values of less than 5.5 that collectively39 have a 67% higher conflict intensity (4.6) than all other F states (2.8) with weaker capacity. This is consistent with the emerging phenomenon of MIFF states (middle-income but failed or fragile; Economist 2011) where rising incomes do not necessarily ensure increased stability (Chandy and Gertz 2011). In particular, Nigeria and Pakistan were singled out by the Economist (2011) as prime examples of MIFF states. Furthermore, it turns out that the legitimacy scores of these economically stronger, but more violent S and F states are worse than their counterparts with weaker capacity. This supports Hegre’s (2014: 159) recent supposition that “economic development is unlikely to bring about lasting peace alone, without the formalization embedded in democratic institutions” and that of Walter (2015), and Krueger and Laitin (2008) who advocate that increased accountability to the governed population is a more effective means of eliminating violence than increasing economic status. The majority of the 34 state transitions from either deterioration to improvement or vice-versa were dominated by changes in legitimacy. Legitimacy also worsened, slightly but significantly over time, which is consistent with the recent supposition that political and civil liberties have deteriorated globally over the last several years (Glenn et al. 2015). This should warrant some concern given that weak legitimacy is the Achilles heel of brittle states. It is noteworthy that Egypt, Libya, and Tunisia, categorized as brittle states prior to 2011 (see online Appendix B), succumbed to regime-changing uprisings during the Arab Spring in 2011, while Saudi Arabia, also categorized as brittle but with a high capacity, successfully appeased its population through financial means.40 Legitimacy is also highlighted as a target of concern in states with insurgency challenges; to effect positive change, it is necessary to improve the state’s “commitment and motivation and to increase legitimacy” (Paul et al. 2013: xxix). Indeed, Andrimihaja et al. (2011) argue that most fragile states should be treated differently from those with better policy structures with aid focused on reducing corruption. This was exercised in 2013 when US$ 16 billion of development assistance to Afghanistan by donor nations was conditional on fair elections in 2014 (Norland 2014), which turned out less than satisfactory and prolonged an uncertain future.41 Kaplan (2009) suggested that weakness in social cohesion and institutions are barriers to typical interventionist solutions such as competitive elections. Kaplan (p 74) further concluded that “States cannot be made to work from the outside” and that “The key to fixing fragile states is to deeply enmesh government within society”. In other words, political versus technocratic reforms is required to achieve change in state weakness (Wesley 2008). This can only be realized with legitimacy through mutual trust. Yet, while legitimacy might be recognized as the key to reducing violence (Hegre 2014; Walter 2015) and to improving the status of a brittle, struggling functional, or fragile state as our analysis suggests, such a transition might be trumped by intransigent political self-interest (e.g., Traub 2011). From a policy perspective, this study applied longitudinal data to assess the trajectories of different state types using a hybrid of data-driven and concept-driven approaches. Caught in a low level equilibrium, many weak states appear to be trapped in perpetual political and economic limbo, as portrayed by the turnover region in Bremmer’s “J-Curve” (2006).42 Such states, by definition, are characterized by weak policy environments, making engagement in them particularly challenging. States that we identify as brittle and impoverished reside above the turnover region on either side of it (left and right, respectively). What our categorization of states cannot directly answer are questions such as will ODA push a fragile state towards impoverished status or does movement to I lead to greater ODA. Or will conflict push a state towards fragile status or does movement to F lead to (greater) conflict? Unpacking such causal relationships requires deeper analysis. That is, if the goal of policy relevant interventions is to be fulfilled, then a crucial next step would be to identify the sub-indicators (i.e., the components that comprise the Worldwide Governance Indicators) where changes are most likely to alter the possibility of deterioration or improvement for weak states (i.e., transitioning into or out of impoverished, brittle, struggling functional, and fragile states). For example, to advocate a policy response to poor legitimacy, targeting a state’s control of corruption, and/or voice and accountability only provides general direction; in-depth country analysis is required for a specific response. A subsequent second step would be to develop specific scenarios for each country case to complement a risk analysis (e.g., CIFP Fragile States Report 2014). Scenarios would provide the analyst with an opportunity to determine how hypothetical variations in A-L-C are likely to effect the country’s trajectory and the level of interdependence among the A-L-C dimensions within a specific country setting (‘knock on effects’). A third step would be to match A-L-C outcomes to specific policy responses in order to determine the level, kind, and duration of effort needed to promote positive transitions. Country profiles capturing the full range of potential entry points would be useful at this stage of analysis. Ideally, the drafting of such scenarios would be conducted in partnership with a specific end user from the policy community who would work with the research team to identify the resources needed to generate effective policy response. Complementary analyses focusing on events data, leadership profiles, and decision making processes are also crucial components to the larger early intervention enterprise (Carment et al. 2009, O’Brien 2010). Such findings need to be shared and incorporated into a broader study to achieve the objectives of synthesis, accumulation, and integration – all hallmarks of a successful policy relevant research programme. 1The term Poor State Performance is adapted from the work of Gutiérrez-Sanín et al. (2011). 2Our analysis goes beyond using a trichotomy of structural features (explained further in the text) by categorizing states into various clusters that identify different types of weak states. This objective is similar to the current efforts of the OECD’s INCAF Working Group to both qualify and quantify state fragility. 3See http://globalpolicy.gmu.edu/political-instability-task-force-home/ (PITF is no longer active). 4Now called the Fragile States Index (Fund for Peace 2014). DOI: http://www.ffp.statesindex.org/rankings. 5More restrictive classifications use the Millennium Development Goals or combine these with a governance index. For example, the Organization for Economic Cooperation and Development (OECD) uses a fragility index to identify countries that lack political commitment and insufficient capacity to develop and implement development policies. 6E.g., see the policy of the US Government (2002) The National Security Strategy of the United States of America. The White House: Washington, D.C. DOI: http://www.whitehouse.gov/nsc/nss.html. 7For example, Grimm et al. draw attention to problems of isomorphic mimicry within receiving states and issues tied to advancing the political agendas of donor countries. 8It may be suggested that such criticism of the World Bank’s CPIA Fragile States Index is unwarranted since its originators did not intend for their work to be used as a country ranking system. To be specific, CPIA country ratings are based on subjective assessments and specific indicators such as those tied to poverty, inequality, and institutional design. The focus is more on policy environments than outcomes. 9A detailed defence of a state based approach to assessing fragility is provided in Chapter 3 of Carment et al. (2009). We argue that using the state as a reference point allows us to consider both structural properties that evolve over time and relational properties such as state society interactions through which legitimacy is derived and institutional performance can be observed. 10Also see Andrimihaja et al. (2011) and Pritchett et al. (2012). 11E.g., the FSI’s categorization of weak states under labels of alert and warning still begs the type of intervention that might be required to assist such states most effectively. 12See Carment et al. (2006, 2009) and www.carleton.ca/cifp for detailed characterization and development of the A-L-C concept. 13See Piloting the Principles for Good Engagement in Fragile States. OECD DAC Fragile States Concept Note, 17 June 2005 (p 8). DOI: http://www.oecd.org/officialdocuments/publicdisplaydocumentpdf/?cote=DCD(2005)11/REV1&docLanguage=En. 15The WGI have been criticized as essentially measuring the same broad concept (Langbein and Knack 2010), yet this has been countered as a flawed analysis of causality and correlation (Kaufmann, Kraay, and Mastruzzi 2010). 16For example, China ranked 3rd in 2012 GDP but only 97th in GDPpc in contrast to Singapore that ranked 38th in GDP but 21st in GDPpc. 17Log-transformation is similarly applied to the income component of the UN Human Development Index. DOI: https://data.undp.org/dataset/Table-2-Human-Development-Index-trends/efc4-gjvq. 18E.g., this resulted in China and Singapore ranking 15th and 24th, respectively, in 2012 (the US was 1st). 20Note that although FI was not used in the clustering algorithm, it represents the average of A, L, and C that were used and conveniently simplifies the selection criteria. 21Choosing FI separation values other than 4.6 would result in a larger number of displacements. 22These and all other comparisons were statistically tested using one-way ANOVA with Newman-Keuls post-hoc significance at p < 0.05. 23Intrastate conflict is coded as Type 3 “internal armed conflict between the government of a state and one or more internal opposition group(s) without intervention from other states” by UCDP. DOI: http://www.pcr.uu.se/research/ucdp/datasets/ucdp_battle-related_deaths_dataset/. 25Source: www.oecd.org/dac/stats/idsonline (last updated 22 Dec 2015 in current $US). 26Using linear regression with significance acceptance at p < 0.05. 27Conflict statistics are reported by UCDP under Israel, but assigned in this study to West Bank and Gaza. 28This excludes transitions between I and B status given that no statistical difference in their FI was found between these two state types. 2921 states transitioned back to their initial status while one state, Nicaragua, transitioned from I to S status in 2008, and then to B status in 2013 (see above footnote). 30FSI rank denotes worse to best in ascending order based on a scale from 0 (best) to 120 (worst). 31In addition, it is quite peculiar that Belgium, France, Japan, Singapore, United Kingdom, and United States were all classified by FSI as ‘Stable’, which is one level below ‘Sustainable’, whereas these states are more reasonably classified at the highest level of state functionality (H) by our model. 33E.g., Fragile States 2013: Resource Flows and Trends in a Shifting World. OECD DAC International Network on Conflict and Fragility Report. DOI: http://oecd-library.org. 34The propensity of intrastate violence in these states, however, is not unexpected given that one of the four Worldwide Governance indicators used to define authority is the ‘Absence of Violence/Terrorism’. 35See Early Warning Project posted 31 Jul 2014. DOI: http://cpgearlywarning.wordpress.com/2014/07/31/2014-statistical-risk-assessments/. Malawi and Rwanda, both categorized as impoverished in 2013, were the two exceptions. 36This grouping includes Equatorial Guinea with an average capacity of 5.38 with no conflict. 37The increased domestic expenditure (e.g., social services) by Saudi Arabia has been dubbed the “national bribe” (e.g., see Lesch 2012: 145). 38Human Rights Watch “Today We Shall All Die” (Mar 2015) re-affirmed that “Widespread, rampant corruption [in Afghanistan] has contributed to human rights abuses and impunity.” and that “This grand corruption is extremely damaging to state-building efforts …”. DOI: http://www.hrw.org/news/2015/03/03/afghanistan-abusive-strongmen-escape-justice. 39The J-curve depicts the relative stability of a state as a function of openness, which relates to legitimacy in our model. The authors are grateful for the kind support of the Social Science and Humanities Research Council of Canada, and for the constructive critique of the reviewers. Andrimihaja, N A, Cinyabuguma, M and Devarajan, S (2011). Avoiding the Fragility Trap in Africa, World Bank Policy Research Working Paper 5884. http://wwwwds.worldbank.org/servlet/WDSContentServer/WDSP/IB/2011/11/17/000158349_20111117111212/Rendered/PDF/WPS5884.pdf. Arbour, L (2012). Crisis and Conflict: Global Challenges in 2012. International Crisis Group Speech, Available at: http://www.crisisgroup.org/en/publication-type/speeches/2012/crisis-and-conflict globalchallenges-in-2012.aspx [Last accessed 14 Febuary 2016]. Baliamoune-Lutz, M and McGillivray, M (2008). State Fragility: Concept and Measurement, UN University – World Institute for Development Economics Research, Paper 2008/44. http://www.wider.unu.edu/publications/working-papers/research-papers/2008/. Beehner, L and Young, J (2012). The Failure of the Failed States Index, Available at: http://www.worldpolicy.org/blog/2012/07/17/failure-failed-states-index [Last accessed 27 January 2016]. Bremmer, I (2006). The J-Curve: A New Way to Understand Why Nations Rise and Fall. New York: Simon and Schuster Inc..
Carment, D and Harvey, F (2000). Using Force to Prevent Ethnic Violence: An Evaluation of Theory and Evidence. Westport, CT: Praeger. Carment, D, Prest, S and Samy, Y (2009). Security, Development and the Fragile State: Bridging the Gap Between Theory and Policy. New York: Routledge. Coggins, B (2014). Fragile is the New Failure, Available at: http://politicalviolenceataglance.org/2014/06/27/fragile-is-the-new-failure/ [Last accessed 17 March 2016]. Collier, P, Elliott, L, Hegre, H, Hoeffler, A, Reynal-Querol, M and Sambanis, N (2003). Breaking the Conflict Trap: Civil War and Development Policy. Washington DC: World Bank/Oxford University Press. Country Indicators for Foreign Policy (2014). Fragile States Report, Available at: www.carleton.ca/cifp [Last accessed 13 October 2015]. de Cilliers, J and Sisk, T (2013). Assessing long-term state fragility in Africa: Prospects for 26 ‘more fragile’ countries, Institute for Security Studies Monograph, No. 188. http://www.issafrica.org/uploads/Monograph188.pdf. Faust, J, Gravingholt, J and Ziaja, S (2013). Foreign Aid and the Fragile Consensus on State Fragility, German Development Institute Discussion Paper 8/2013. http://www.die-gdi.de/uploads/media/DP_8.2013.pdf. Fund for Peace (2014). Fragile States Index, Available at: http://ffp.statesindex.org/ [Last accessed 21 January 2016]. Furness, M (2014). Let’s Get Comprehensive: European Union Engagement in Fragile and Conflict-Affected Countries, German Development Institute Discussion Paper 5/2014. http://www.die-gdi.de/uploads/media/DP_5.2014.pdf. Glenn, J C, Florescu, E and Millennium Project Team (2015). 2015–16 State of the Future, : 52–65. Foresight for Development, The Millennium Project, http://integralleadershipreview.com/13410-819-2015-16-state-of-the-future-the-millennium-project/. Goldstone, J (2009). Pathways to State Failure In: Harvey, S ed. Dealing With Failed States: Crossing Analytic Boundaries. London, UK: Routledge, pp. 5–16. Grävingholt, J, Ziaja, S and Kreibaum, M (2012). State Fragility: Towards a Multi-Dimensional Empirical Typology, German Development Institute Discussion Paper 3/2012. http://www.die-gdi.de/uploads/media/DP_3.2012.pdf. Gutiérrez-Sanín, F (2009). The Quandaries of Coding and Ranking: Evaluating Poor State Performance Indexes, Crisis States Working Papers Series No. 2, Working Paper No. 58. http://www.lse.ac.uk/internationalDevelopment/research/crisisStates/download/wp/wpSeries2/WP582.pdf. Gutiérrez-Sanín, F, Buitrago, D, González, A and Lozano, C (2011). Measuring Poor State Performance: Problems, Perspectives and Paths Ahead, Crisis States Research Centre Report. http://r4d.dfid.gov.uk/PDF/Outputs/CrisisStates/R8488-MPSPreport.pdf. Hoeffler, A and Outram, V (2008). Need, Merit or Self-Interest – What Determines the Allocation of Aid?, : 17. Centre for the Study of African Economies WPS/2008–19, http://core.kmi.open.ac.uk/download/pdf/6270381.pdf. Kaplan, S (2009). Fixing Fragile States. Policy Review 152: 63–77. Kaufmann, D, Kraay, A and Mastruzzi, M (2010). Response to: The Worldwide Governance Indicators: Six, One, or None. (see Langbein and Knack 2010). http://siteresources.worldbank.org/DEC/Resources/ResponseToKnackLangbein.pdf. Lesch, D W (2012). Syria: The Fall of the House of Assad. New Haven, CT: Yale University Press. Pritchett, L, Woolcock, M and Andrews, M (2012). Looking Like a State: Techniques of Persistent Failure in State Capability for Implementation, United Nations University – World Institute for Development Economics Research Working Paper 2012/63. http://www.wider.unu.edu/publications/working-papers/2012/en_GB/wp2012-063/. Rogerson, A and Steensen, S (2009). Aid Orphans: Whose Responsibility? (1) Organization for Economic Cooperation and Development, Development Brief, https://www.oecd.org/dac/effectiveness/43853485.pdf. The National Security Strategy of the United States of America (2002). Washington, DC: The White House. Available at: http://www.whitehouse.gov/administration/eop/nsc/ [Last accessed 16 December 2015]. Tikuisis, P and Mandel, D R (2015). Is the World Deteriorating?. Global Governance 21: 9–14. Wesley, M (2008). The State of the Art on the Art of State Building. Global Governance 14(3): 369–385.